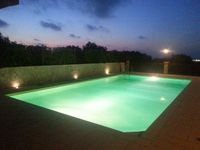 Properties in Church of Santa Maria del Casale average 4.7 out of 5 stars. A beautiful loft among the olive trees ..
Property 7: A beautiful loft among the olive trees ..
villa in the countryside 500 meters from the sea, with garden and private parking. Property 14: villa in the countryside 500 meters from the sea, with garden and private parking. Property 25: Country house, for vacation. Masseria in Torre Guaceto immersed in centuries-old olive grove !!! Property 32: Masseria in Torre Guaceto immersed in centuries-old olive grove !!! We enjoyed our stay. Loved being a little bit out of town and the trullo/villa had everything we needed. All i can say is that the house was exceptional, clean , spacious, the swimming pool and bar-b-qua area was also to a very high standard, the owner, Danielle was very helpful with advice on what to visit and where to go. I would certainly return to this property and would recommend any of my friends and family to also stay here.